A former gymnast, dancer and cheerleader, Carin began practicing Pilates to strengthen her core, promote whole-body fitness and rehabilitate various injuries. To continue her passion for Pilates, and to help others see the benefit of creating the mind body connection, she completed her instructor certification from Rock The Reformer in Washington DC, and continued on to become comprehensively trained through Balanced Body, Inc. After many years in corporate America, Carin turned in her high heels for toe socks, and never looked back! She has worked for several studios as an instructor, training manager and marketing consultant and has over 20 years experience in dance, movement and Pilates. She opened Right Balance Pilates in Lewes, Delaware to bring her love of Pilates and movement to the beach area. Carin is also the program director for Right Balance Teacher Training. Training new instructors has become a rewarding part of her Pilates journey, and incorporates her past experience from a long career in Training & Development. When Carin isn’t at the studio, you can find her supporting her husband and three kiddos in their many activities or traveling the world - often finding a Pilates studio in each city she visits! Pamela is a NETA Certified Personal Trainer and an ACE Certified Group Exercise Instructor with specialties in Pilates including both MAT/standing and Reformer Comprehensives. She received her certification through the Physical Mind Institute in NYC in 2004 and taught in New Jersey from 2005-2017. Her interest in a career in the fitness industry started with the encouragement of her physical therapist to pursue Pilates training during her own personal rehabilitation. It wasn't long before Pamela recognized that the whole-body approach was critical to the recovery process. Pamela is dedicated to sharing this approach of lifetime wellness and movement thru the awareness of Pilates with others. As a Personal Trainer she loves working with different modalities and looks forward to assisting you to reach your goals one on one. Pamela and her husband moved from the Northern New Jersey area to the bucolic and historic town of Milton after his retirement. Presently, they are hosting two foreign exchange students from Japan and South Korea supporting their educational and extracurricular endeavors here in America. They are also preparing to accept two additional exchange students from South Korea and Thailand mid-summer for the upcoming school year. When she is not teaching at Right Balance Pilates, she loves to cook, garden, read, take long walks with her dog, Annie and spend time with her husband, Michael. After serving as an Orthopedic Physical Therapist for 23 years in the Baltimore area, Laura decided to make Rehoboth Beach her forever home. Laura has been integrating Pilates into her PT practice for years. During her tenure in Baltimore, she incorporated physical therapy and Pilates in a blended wellness plan for patients looking for core stabilization and greater mind/body balance. To expand her repertoire, Laura recently completed Right Balance Pilates Reformer Teacher Training in Lewes, Delaware. Laura continues her education by attending Pilates workshops and related training. Laura is scheduling both private and group sessions to motivate, energize and empower clients with a greater understanding of balanced movement and overall health. As a registered dietitian, Lynleigh has a long history in health and wellness. She started practicing Pilates over ten years ago to cope with severe chronic back pain. Due to the positive outcome of her own Pilates practice, Lynleigh became an instructor to assist others in finding the balance between physical limitation and growth. 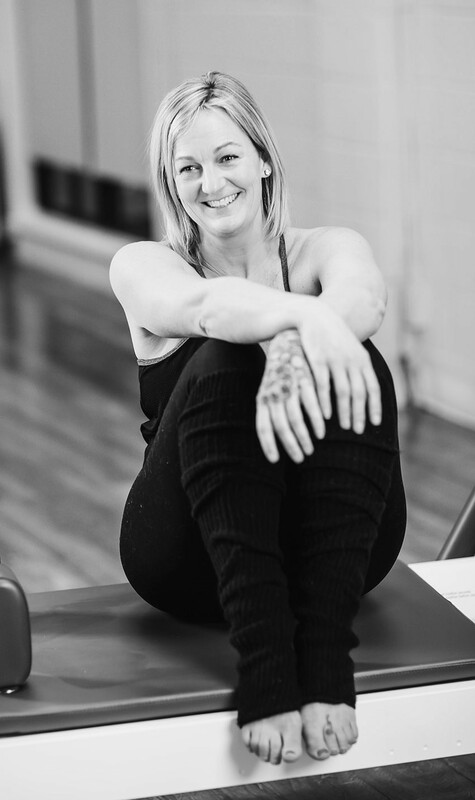 Lynleigh is a graduate of the Right Balance Pilates Reformer and Mat Teacher Training in Lewes, Delaware, and is continually participating in workshops and training throughout the Pilates industry. Other than spending time in the studio, Lynleigh looks forward to her annual family vacation in Maine, sitting down with a good book and a cup of coffee and supporting her husband and two daughters in their various endeavors. Irish is a former educator, marketing specialist, lifelong athlete and avid swimmer. Initially, Irish incorporated Pilates into her everyday routine to improve strength, flexibility and balance, but got hooked because of the positive results. Irish is a graduate of the Right Balance Pilates Reformer Teacher Training and currently teaches at the studio. To further her teaching journey, she went on to complete her Mat Teacher Training in the Winter of 2019. She is committed to helping each client reach their individual goals through continued movement and practice. Because of her love for the beach, Irish moved to Rehoboth in 2012 with her twins and new husband. Irish enjoys being anywhere the action is, whether it’s a day at the beach, hanging at Starbucks, or doing karaoke at the Parrot. A lifelong fitness enthusiast, Tanya discovered and fell in love with Pilates in 2005 and started her journey with both Mat and Reformer classes. She was amazed at the whole body approach and results and believed in the method so much that she wanted to share it with others. Her adventures in teaching began in 2008, teaching Mat Pilates classes at a local gym and she hasn’t looked back since then. Tanya completed RTR Pilates’ group reformer instructor certification in 2013 and then in 2016 she completed her Balanced Body comprehensive training program. Tanya is a member of the Pilates Method Alliance (PMA) and regularly attends their Annual Conference for continuing education and indulges her inner pilates nerd by attending various specialized pilates workshops whenever they pass through the DC area. Tanya enjoys all aspects of teaching and is a passionate movement specialist that works for several studios in both Washington DC and Maryland where she teaches group mat classes, group reformer classes and private sessions. She is also a guest instructor, consultant and workshop presenter at Right Balance Pilates and recently became a Master Instructor for the RBP Teacher Training program. When attending one of her classes, workshops or private sessions you can expect in-depth cueing, insightful/varied teaching, functional full body connections and a bit of humor to balance it all out. Eileen began her career instructing exercise by obtaining a Master's degree of Physical Therapy in 1995 from Medical College of Virginia. A year after she graduated, she was hit by a car while running and had to begin practicing what she was preaching. Yoga became part of her lifestyle. She continued to attend annual education classes and eventually pursued a Certification in Hand and Upper Quarter Rehabilitation through Drexel University. In 2010, Eileen broke her back, pelvis and ribs while skydiving. Through excellent physical therapy, yoga, and core stabilization exercises as well as an SI Belt, she was able to avoid surgery and began a slow process of healing. In 2014, she pursued her RYT-200 and Pilates instructor rating through ACE in Cadillac, Reformer, Mat, Tower and Chair Pilates. After adding Pilates into her fitness regimen she was able to eliminate even anti-inflammatory medications to stay pain free. In April, Eileen will attend Balanced Body, Inc. Pilates On Tour London for MOTR-Instructor Training which is a portable device combining the core training from Pilates with aerobic condition and strengthening, functional exercising through a pulley system, and the balance and tissue release of a foam roller. She will also attend a Gait Control course, which will focus on how even small muscle imbalances can affect your daily walking pattern, forming gait deviations and possibly pain and dysfunction. Eileen will bring all of this back to Right Balance Pilates to assist with your personalized Pilates practice. Kimberly retired from the Defense Department after 30 years of service and moved to the Rehoboth area to enjoy the beach and the many activities it has to offer. Kimberly has always been a believer in exercise and movement to stay healthy. Kimberly began a regular practice of Pilates when Right Balance Studio opened in Lewes, DE. She realized how quickly change came to her body in strength and overall movement and how much fun she has on the equipment. As the RBS Studio Manager, Kimberly also provides administrative and marketing support for Right Balance Pilates. Kimberly is a graduate of the Right Balance Pilates Reformer Teacher Training and substitutes in Reformers Pilates and Paddle Board Pilates classes. Jessica is a graduate of Palmer College of Chiropractic in Davenport, IA. As a practicing chiropractor in Rehoboth Beach, Jessica focuses on proper form and function of the human frame within her professional life. She is a former collegiate track athlete and has always been drawn to fast-paced competitive sports. Due to previous injuries, Jessica began practicing Pilates at Right Balance. She fell in love with the perpetual challenge and precision of the practice and has now made it a part of her lifestyle. Jessica recognized how Pilates could not only benefit her, but also her patients by improving core strength, balance, and posture. This led to completing the Right Balance Pilates Reformer Teacher Training. She enjoys both the therapeutic aspect of Pilates that she has brought to her chiropractic practice as well as the group fitness aspect as an instructor at Right Balance. Originally from Montana, Jessica has made the Rehoboth Beach area her home. She enjoys running, paddle boarding and spending time with her kids.